User Tracker Count: 50 times. Watch out here we come. A unique water ride. The reverse part of the ride is the best part of the ride. 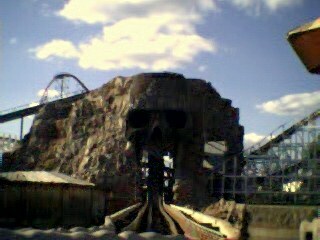 It needs to be slowed down so you can see the theming on the ride and you need to get more wet. On the good side: the backwards drop is nice, especially as it has a dip, which is especially good when you cant see it coming. The main (forwards) drop is bigger than it looks from the outside, and gives you a decent splash. The not-so-good: It loads slowly, there are some dull stretches between drops, and the attempted pirate theming could best be summed up as "eh". This is a nice long and well themed water ride. I love going backwards and that big drop at the end. However, if you ever go to this park, youll be lucky if you see it open. Most of the times I visit SFA, this rides closed. Im pretty sure its due to staff shortages. A very slow and boring ride. it was alright, the whole lifting and turning was incredibly slow and tiresome. also it kept breakign down. Pretty pathetic for all the money they claimed they spent on it. The backwards drops are cool, but other than that it is really not too exciting. There is themeing, but the boat is going to fast to look at it. The lift hills are extremely slow an lately they have only been running 5 boats, making the wait very very long. a slow long and boring ride! u barley even get wet! A unique wet ride. I like going down the hill in reverse followed by the unexpected hop.